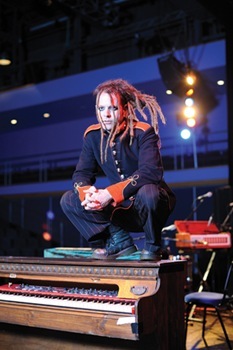 Desiring to be creative is among the many inspirations for Duke Special, whose latest work mimics a fictional silent movie actor’s testing times. Peter Cheney caught up with the alternative artist just before his second Belfast gig. A regular name at festivals and more intimate appearances in Europe and the States, Duke Special’s current tour took him home to his Belfast roots in early June. In the past, he thinks he shone the spotlight on himself with his songs, but now it’s shining on other people. Foremost among them is Hector Mann, the silent movie star of 12 films, invented by American writer Paul Auster in ‘The Book of Illusions’. Duke penned ‘Mister Nobody’, pointing to Mann’s career ending, and asked 11 friends to write one song each based on the other films. He is taken by the way that each of Mann’s movies “almost point to actual events that were going to happen in his own life”, up to his own disappearance. 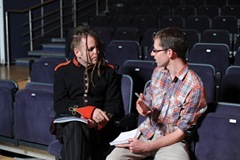 ‘The Silent World of Hector Mann’ formed the second of the concert’s three parts, the first being English singer Hannah Peel’s songs on a music box and the last a selection from his soundtrack to Brecht’s play Mother Courage. It’s easier for an artist to be a “big fish in a little pond” but touring brings challenges that can only have a good influence on a musician’s career.